Data centers have become known not only for supporting critical applications and data storage, but also for the amount of energy they utilize to carry out these functions. 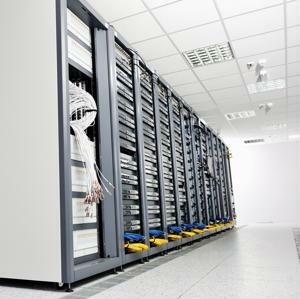 However, industry innovators have recently taken steps to improve data center energy efficiency and power consumption. One significant way these organizations achieve their goal of reduced power use is through the utilization of temperature monitoring technology. These systems can lessen electricity consumption where it occurs most - within data room cooling arrangements. Installation of temperature sensors in key locations of the facility allows operators to configure infrastructure to consume only the necessary amount of power to keep these systems cool, as well as prevent overheating and improve server uptime. An increasing number of companies also use alternative forms of energy to power their data center facilities. One such source is that of fuel cells created by Bloom Energy. Fuel cells are mechanisms that turn material into electricity; usually cells utilize a chemical reaction to transform natural gas into a usable, clean-burning energy source. One of the first organizations to adopt fuel cells for data center power was online auction company eBay. The organization selected this energy source for its data facility in Utah, now primarily powered by 30 cells, according to GigaOM. EBay told the source that this kind of electricity arrangement not only improves the environmental footprint of the facility, but also boosts server uptime as it allows a data center to be unaffected by power grid failures. After the fuel cells were installed, eBay said the data center only relies on other energy sources for backup. EBay plans to add more fuel cells as they are needed to power additional equipment. The organization aims to keep the facility independent of the local energy grid. Following in eBay's footsteps is financial organization JPMorgan Chase, which recently announced plans for fuel cell installation at the company's Delaware data center. JPMorgan Chase's Christiana campus in Newark will be powered by a 500 kilowatt Bloom Energy fuel cell arrangement, according to Datacenter Dynamics. While this fuel cell deployment is only a pilot project for the company, Bill McHenry, JPMorgan global head of property operations, said the organization hopes to expand its use of this technology in the future. "We are able to not only improve our facility right here in Delaware, but also fulfill our company-wide commitment to investing in new technologies designed to reduce our impact on the planet," McHenry said. Verizon also adopted fuel cell technology to power their California facilities, according to GigaOM. The telecommunications company recently announced that it aims to spend $100 million on environmentally friendly energy options, and the purchase of fuel cells from Bloom Energy and ClearEdge Power is part of this strategy. The company will utilize 10 fuel cells that supply 200 kilowatts of power each. Once these are in place in Verizon's California data centers, the fuel cells will provide more than 16 million kilowatt hours of energy annually. This would account for one quarter of the company's clean power capacity plans, according to GigaOM. GigaOM stated that motivations for organizations to adopt this kind of technology in their data centers include improving server uptime and reliability. Verizon already had fuel cells in place in their Long Island data center during Hurricane Sandy, which hit the region in October 2012. While many other facilities were forced offline due to the severe weather, Verizon's switching station maintained server uptime and remained online. In addition to the benefits of temperature monitoring technologies, fuel cells offer opportunities to reduce the environmental impact of data center facilities.